Crazytown. Absolute crazytown. Before March of this year I don't think any sort of "diet" Ashley and I had ever gone on stuck more than 5 days. But since then we've spent 3 months with (mostly) no sugar, wheat and dairy, 21 days on an insane detox and now we're halfway through Whole30 in the month of August. Who are we? We are in crazytown. Posting everything you eat every day is nearly impossible, and while we will be sharing some delicious new recipes with you soon, we thought we'd take today to reflect a bit about non-food things we've started to notice as a result of being on this journey. I'll go first, and then Ashley will chime in below. Much like when we stopped the sugar/wheat/dairy earlier this year*, I've noticed a new level of focus, energy and just plain feelin' great. Not that I thought I felt bad before. It's kind of hard to explain, but once you've been away from a lot of processed food for a couple of weeks you'll understand. It's like there's this whole other side of you you didn't realize was there. I just feel great. Like all the time. I'm not as frantic about food as I used to be. When your sugar levels are crashing constantly it leads to all kinds of weird cravings. I will say the first week I was craving all kinds bizarre things. Like Fig Newtons. Really, Jon? You would break your Whole30 pledge for a Fig Newton? Pull it together! But now - I don't know - I'm just not worried about food as much. I know what we need to eat and most of the sugar heavy, empty carb stuff just doesn't sound good to me. Who am I?! Crazytown. Even weirder, my skin is different. I've generally had chronically dry skin since I can remember, but the last week rolling out of bed I haven't even needed lotion or coconut oil to make it stop looking like the desert. All this makes me think that I've literally been drugging myself with processed food, sugar and wheat - and causing all sorts of unrelated issues in my body. Did I mention I used to have terrible acid reflux before we started this and now it's 100% gone? Crazy. Town. Guys, let me tell you about my feet. As long as I can remember my feet have been so callused and cracked and dry and just gross and embarrassing really. Like, so bad I was too embarrassed to go get a pedicure. Now, my feet are looking so good. They are soft, not cracked look 90% better. That's the first thing I've noticed in the last 17 days. Next up, my clothes y'all. My pants are literally falling off. I'm ready to go down a size in jeans but refuse to buy jeans until the next size down. I have one old pair that fit 3 kids ago that I am finally wear. After those get big, I am totally going shopping! And that's big news because I absolutely hate shopping. Last thing is my overall feeling of awesome. I'm able to actually get up in the morning and go for a walk before my kids wake up. I have energy all day and don't feel the need for a nap. My head feels clearer (hard to explain). My vision even feels better. Sometimes I used to have a hard time concentrating on things and my eyes would do funny stuff, but they haven't for the last two weeks. I wish I could say all my cravings are gone. We celebrated Ada's birthday with cookie cake and OMG it smelled so amazing. It was all I could do not to eat that piece Ada left on the table. Jon was outside and kids were upstairs...no one would know. But, I didn't do it. It's still in the fridge wrapped up as I begin to drool type this. While I still have the hankering to knock out a dozen Krispy Kreme Doughnuts every now and then, I somehow have the will power to just say no. Which is huge cause I am not know to have much will power. Oh, and grocery shopping. Once you start eating healthy you become hyper-aware of just how much stuff we eat is full of junk - chemicals, sugar, preservatives, etc... It's kind of gross walking around in the grocery store and seeing people's carts filled with so much fake food makes me sad. I totally get it, too - it's so much cheaper to buy the mass produced, pre-packaged stuff, but even though we are spending more eating this way we don't have to go to the doctor, we aren't on medications, we have no real health problems. We're so happy to have tried this Whole30 thing. It has changed our lives. Our kids are eating a lot of what we make and really thinking about their food choices. The last few mornings our 4 year old said he didn't want to eat cereal for breakfast. He wanted to eat some healthy fruit. Like totally on his own - we haven't been pushing them to do this with us. I wish I had known about this my whole life. Not only are we improving our health, we are teaching our kids how they can live healthier as well - and that's what it's all about. 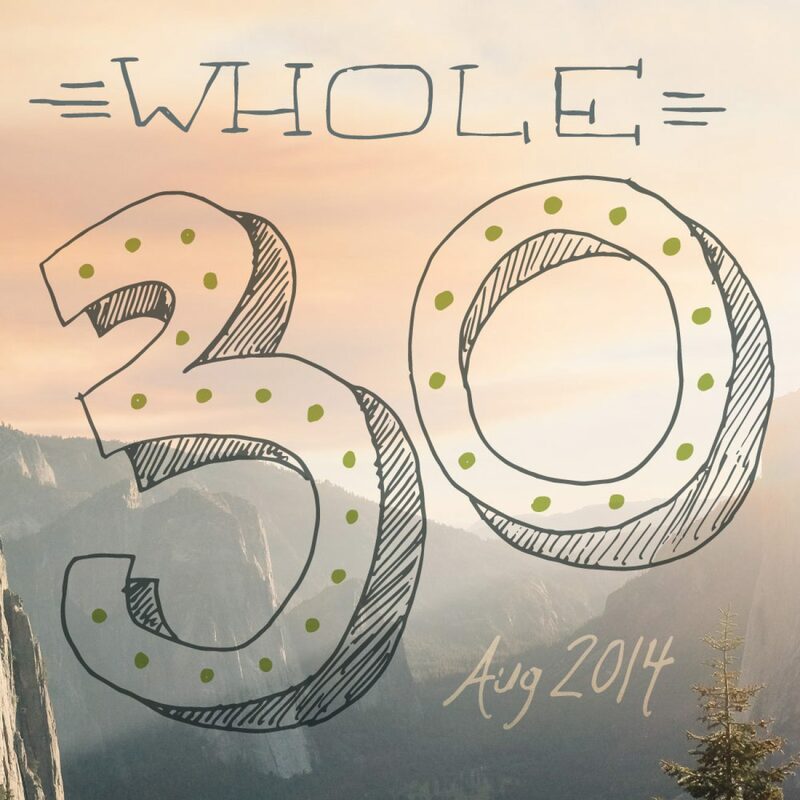 Next up we'll be posting some new recipes and talking about the ways we've messed up while doing Whole30. You heard me - it's time to be a little more realistic because no one's perfect. *The no sugar/wheat/dairy was an aspiration and not to be taken literally :) It was how we ate about 95% of the time, but made exceptions when necessary.